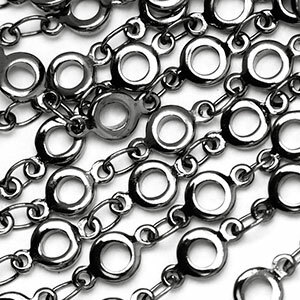 Mini donuts, tiny tires, or bubble links... any way you you describe it this chain is the best. 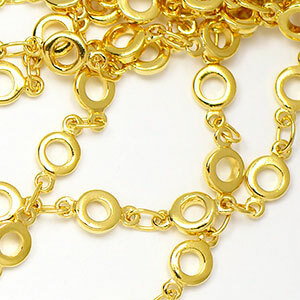 The donut links are connected and separated by plain soldered links making a great chain to dangle beads and charms. 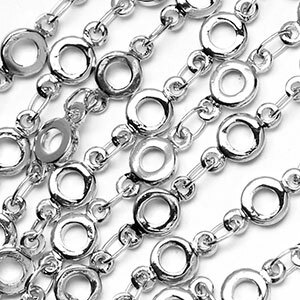 Lovely layering chain, and suitable for bracelets, necklaces and earring designs. Expertly plated in the USA! Donut hole measures approx. 2.75mm to 3mm diameter. The holes are not perfectly centered in each link: some will be centered, some are high and some are low. We ship longest sections with as few connections as possible. However, we cannot guarantee one continuous length for longer sections.